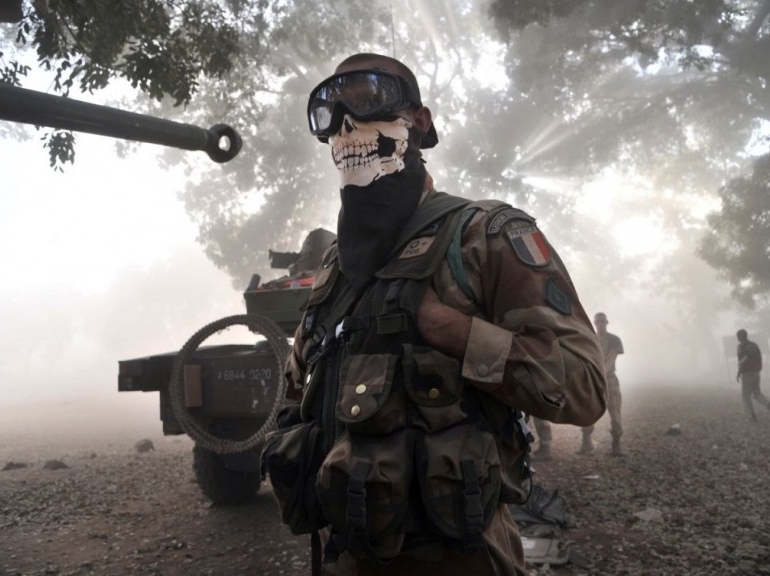 Only thirteen days after starting a war in Mali, France is massively escalating its troop presence there, even as reports emerge of escalating ethnic killings by French-backed Malian troops. On Tuesday the Malian regime extended the state of emergency declared on January 11 for three months. At the same time, French and Malian troops set up positions in central Mali around the strategic airfield at Sévaré. The airfield was reportedly the main initial target of the French intervention. Paris wanted to keep it from falling into the hands of the northern-based Malian opposition, so France could use the airfield to fly troops and equipment into the region. French forces are also blocking journalists from reporting from the war zone, to slow the stream of reports of killings of and atrocities against civilians by French and French-backed Malian forces. In Sévaré, at least 11 people were killed at a military camp, near its bus station and its hospital. “Credible information” pointed to about 20 other executions, with the bodies “buried hastily, notably in wells,” the International Federation for Human Rights (FIDH) reported. A witness said the Malian army “gathered all the people who didn’t have national identity cards and the people they suspected of being close to the Islamists to execute them, and put them in two different wells near a bus station.” The soldiers allegedly poured gasoline into the wells and set them ablaze to hide the evidence. Residents of Mopti in central Mali said that the Malian army had arrested, interrogated, and tortured innocent civilians, because the army thought that they were involved in the rebellion. Many Tuareg, who originally controlled the north, fled south when the Islamists took over and are being singled out for reprisals. Amnesty International claims to have evidence of extrajudicial killings of Tuareg civilians, the indiscriminate shelling of a Tuareg camp, and the killing of livestock. The Malian army has a record of ethnic killings. Last September a truck with eighteen preachers from Mauritania crossed the border at Diabaly on their way to Bamako for a conference. Though none were armed and they had papers indicating their mission, all were massacred by the troops manning the border checkpoint. Amateur cell phone videos on the internet show huge blasts and fireballs in living areas, and bloggers from Mali are reporting numerous casualties. The United Nations has reported that thousands of people have been forced from their homes over the past ten days. An estimated 230,000 people are now displaced across the country. According to Melissa Fleming, a spokeswoman for the United Nations’ refugee agency, the violence could soon displace up to 700,000 in Mali and around the region. The Norwegian Internal Displacement Monitoring Center reported that people in the north were increasingly heading into the desert, as Algeria had closed its borders. Many are fleeing on foot because they cannot afford boats or buses. The constant increase in the number of soldiers, the massive build-up of ever-deadlier weapons and the increasing willingness of its allies to step up their support signify that such violence will only continue to escalate. France is deploying more soldiers and more high-tech weaponry. Some 2,150 French soldiers are in Mali, and their number will rise to 5,000 by the end of the month. The African-led International Support Mission to Mali (AFISMA) will comprise almost 6,000 soldiers, instead of the initially planned 3,300 soldiers, costing around $500 million. The Gazelle helicopters that participated in the first wave of French air attacks are being replaced by Tiger helicopter gunships, which have a longer range and greater firepower. “Cheetah” units based in France have been placed on alert, including a number of Leclerc heavy tanks and units armed with truck-mounted 155-millimeter artillery pieces. So far nearly 1,000 African troops from Benin, Nigeria, Togo and Burkina Faso have arrived in Mali. Senegalese troops and up to 2,000 soldiers from Chad are on the way. Their transport is being provided by France’s allies: Denmark, Germany, Belgium, the Netherlands, Spain, the United Emirates, and Canada. Italy approved sending 15 to 24 military instructors to work alongside the European Union (EU) in training Malian forces and also agreed to provide logistical support with at least two cargo planes. US forces began their mission in support of the Mali war on Monday. Five four-engine C-17 planes took off from the Istres-LeTubé airbase in southern France, loaded with French cargo which they dropped off in the Malian capital, Bamako. According to German news magazine Der Spiegel, British forces were on “high alert” for possible deployment in Mali, in case France asks for help. The British foreign ministry denied the report, however. Kande’s words are in line with remarks by British Prime Minister David Cameron, who said that the Mali war might last years or decades. Canadian armed forces are deeply implicated in the French invasion of Mali: here. President Francois Hollande of France has personally authorised at least 40 “targeted killings” abroad – including of French citizens over the past three years, it has been claimed: here. Controversial Dutch officer to Mali war? This entry was posted in Crime, Human rights, Media, Peace and war and tagged France, Mali by petrel41. Bookmark the permalink.